Unless you’ve been living under a rock you know AI (artificial intelligence) assistants are the new must-have tech gadget. They are quickly popping up in homes everywhere and making families lives so much easier. Google Home with its Google Assistant has the deepest wealth of knowledge to pull from (ahem… Google Search) and can sync up with your existing Google account preferences. Which means you don’t have to worry about downloading extra apps, creating new accounts or recreating the content and information you already have elsewhere. 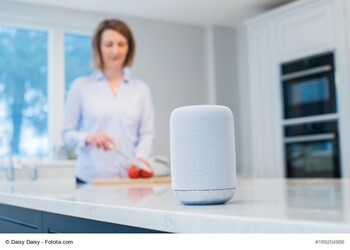 To perform tasks Google Assistant uses pre-established “Home Commands” that trigger an action. To signal that you are speaking to the assistant you start your request with “Okay Google”. If you have an Android you might already be familiar with this process. Which is another tick on the pros column for Google Home for those who are keeping tally. Get your itinerary by asking “Okay Google, what do I have planned next week” or “What do I have planned today”. Google Assistant will pull right from your Google Calendar and remind you of upcoming appointments, reminders, and events. Set a timer when cooking by simply stating how long you need one to be set for. You can also set alarms by request. Change your morning alarm or set up daily reminders to take a medication or start dinner, for example. Control your smart home devices with Google Home. The Assistant can raise or lower the temperature of your home if you have a smart thermostat. It can also turn lights and devices on or off to those hooked up to a smart outlet. Of course, there is always the option to ask Google Assistant to play music, radio, podcasts or an audiobook. Perfect for to keep your mind busy during those deep cleaning days or when exercising at home. Never forget anything again by asking the Assistant to remember things for you. It can be anything - to call your mother, pick up a birthday present to your nephew or know how long that sauce has been in the fridge. Then when you need to know you can simply ask for the Assistant to remind you. Order pizza through Domino’s. Pizza on demand. Need I say more? With face recognition capabilities Google Home hooked up with a smart doorbell can tell you who is at the door. The Nest Hello doorbell has a built-in camera to allow Google Assistant to recognize faces that you’ve configured it to remember. Use IFTT, the automation app, If This Then That, to come up with your own commands. Use it to create commands that trigger an action of your choosing. You can add to your to-do list, iPhone calendar, and other apps. Ask for the Assistant to call your phone when it inevitably gets lost (probably between the couch cushions).